I am now a condemned traitor . . . I am to die when I have hardly begun to live. Historical expertise marries page-turning fiction in Alison Weir's enthralling debut novel, breathing new life into one of the most significant and tumultuous periods of the English monarchy. It is the story of Lady Jane Grey–"the Nine Days' Queen" –a fifteen-year-old girl who unwittingly finds herself at the center of the religious and civil unrest that nearly toppled the fabled House of Tudor during the sixteenth century. The child of a scheming father and a ruthless mother, for whom she is merely a pawn in a dynastic game with the highest stakes, Jane Grey was born during the harrowingly turbulent period between Anne Boleyn's beheading and the demise of Jane's infamous great-uncle, King Henry VIII. With the premature passing of Jane' s adolescent cousin, and Henry's successor, King Edward VI, comes a struggle for supremacy fueled by political machinations and lethal religious fervor. Unabashedly honest and exceptionally intelligent, Jane possesses a sound strength of character beyond her years that equips her to weather the vicious storm. And though she has no ambitions to rule, preferring to immerse herself in books and religious studies, she is forced to accept the crown, and by so doing sets off a firestorm of intrigue, betrayal, and tragedy. Alison Weir uses her unmatched skills as a historian to enliven the many dynamic characters of this majestic drama. Along with Lady Jane Grey, Weir vividly renders her devious parents; her much-loved nanny; the benevolent Queen Katherine Parr; Jane's ambitious cousins; the Catholic "Bloody" Mary, who will stop at nothing to seize the throne; and the protestant and future queen Elizabeth. Readers venture inside royal drawing rooms and bedchambers to witness the power-grabbing that swirls around Lady Jane Grey from the day of her birth to her unbearably poignant death. 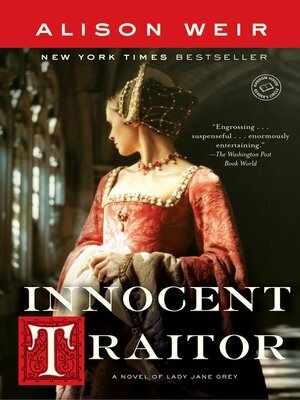 Innocent Traitor paints a complete and compelling portrait of this captivating young woman, a faithful servant of God whose short reign and brief life would make her a legend. BONUS: This edition contains an excerpt from Alison Weir's Mary Boleyn.